On July 12, Russian Orthodox Church celebrates the Feast Day of the Apostles Peter and Paul. It is indeed a very important event for any Christian believer as the veneration of these two great saints has its roots in the very foundation of the Church. Moreover, both Peter and Paul were the leaders of the Apostles and the most significant individuals promoting the teachings of the Lord. It is not surprising that there are so many holy icons depicting these renowned figures of the Apostolic Age, ranging from antique icons dating from the 4th century to modern religious icons that can be found in any store, church, and monastery. As you probably know, the oldest surviving icon of Christ, which is currently preserved in St. Catherine’s Monastery on Mount Sinai in Egypt, dates from the 6th century, while the oldest known depiction of the Mother of God is believed to be painted in the Catacomb of Priscilla in the 2nd century. As for the Holy Apostles Peter and Paul, the earliest depictions of these saints, which date from the latter half of the 4th century, were found in the Santa Tecla catacomb in Rome in 2010. For today, they are considered the oldest surviving antique icons of the Apostles in portrait (see photo above), though even older depictions showing Sts. Peter and Paul also exist but only as part of a narrative scene. In addition to the mentioned above antique icons of saints discovered in Rome, there are also many amazing Russian icons of the Apostles Peter and Paul. The oldest one depicting Sts. 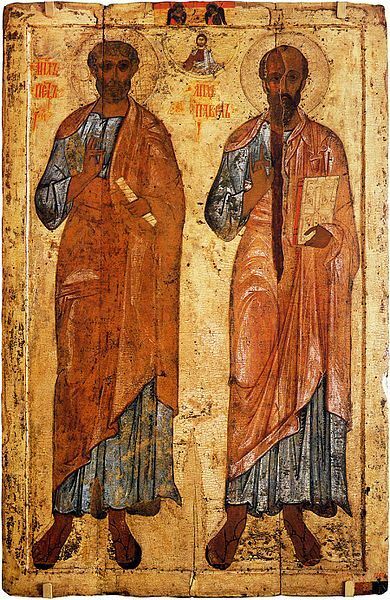 Peter and Paul full-length was painted circa 1050. It came from the Cathedral of St. Sophia in Novgorod where it was kept until the Russian Revolution. Now this beautiful antique icon is displayed in the Novgorod Art Museum. Another amazing example of antique Russian icons depicting the Apostles is the 13th-century icon from the Church of Sts. Peter and Paul in Belozersk. It is currently part of the collection of the State Russian Museum in St. Petersburg. 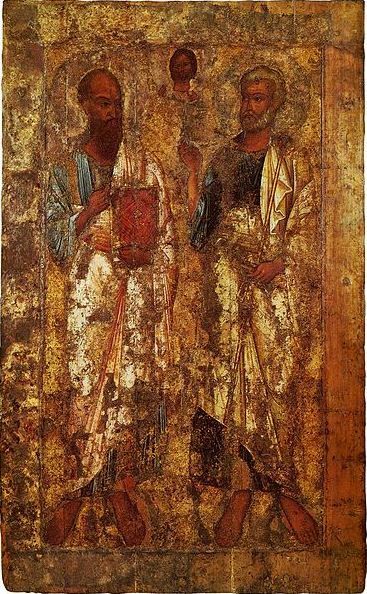 These were the most important antique icons of the Apostles Peter and Paul. However, there are certainly many other beautiful religious icon paintings of these significant saints who played a vital role in the early Christian Church. You can easily find them in churches, monasteries, and art museums throughout the world.